c.1969 Western Kentucky-I will tell you all I can, what I tell you will be the truth. I am not sure of the dates, but it is close, J. K. he worked for me, and I went to the mine (Midway Mining Co) I owned this fluorite, zinc and lead mine. It was about 1969 in the fall, J. K. and I went down to the mine to get some pump parts to build a new pump. It was about 8 AM. We loaded up some parts and went to the machine shop at Frances, KY. about 13 miles from the mine. The machinist, J. K and I worked on the pump until about 9 PM. We had some old parts so we returned them to the mine. I had a shop there then. The mine covered about 2 acres. It was cleared off with some gravel in the lot: there were 2 buildings and a head frame and some mining equipment on the yard and a grassy field all around the mine. One tree behind us, when we pulled into the mine we saw what looked like this new barn in front of us. It looked like a new metal building. J. K. and I talked about it. I pulled the truck up so we could see it better. We were within 80 ft. of it. It looked like a 80 ft. high 80 ft. long and 80 ft. wide. It was as plain as it could be that we were looking at a new building that had been put up. The farmer that owned the land was Doey Binkley. He did not like me mining on his property as he did not own the mineral under his farm, the minerals had been sold to a Mr. Martin in 1907. Doey bought the farm after I was mining. My mining lease forbade me from mining under a existing house, barn, etc, so J. K. and I were talking that the next day I would talk to a lawyer and get this building tore down. We probably talked about the building for 10 to 20 minutes all the time we were just looking at the building in amazement at how fast they had put it up. Then we saw a light like a hand held light coming from the back to the side of the building. I said Doey is here and I will talk to him now. We got out of the truck, and walked to the front of the truck, and the building just went away: no sound, not anything: it just went away. It was clear; not very cold, no fog, no other lights, no water. It was just like a building sitting on the grass and then it went away. 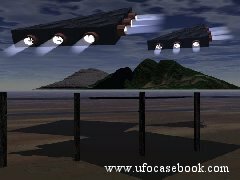 According to the eye witnesses, what appeared to be a building, was really an unknown object with the ability to either disappear, or quickly fly away. Could it have gone into another dimension right before their eyes, or simply vanished? Eye witness report, W. L. D.